John Albert Kitzhaber (born March 5, 1947) is an American physician and former politician. He is the longest-serving governor in Oregon‘s history, as well as the only Oregon governor to resign because of a scandal. He served two terms from 1995 until 2003, another full-term from 2011 until 2015, and was sworn in for a fourth term on January 12, 2015. He resigned on February 18, 2015, with state and federal investigations into criminal allegations against him and his fiancée, Cylvia Hayes. 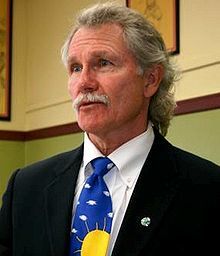 A member of the Democratic Party, Kitzhaber previously served in the Oregon House of Representatives (1979–81) and Oregon Senate (1981–93), including as Senate President (1985–93). He was also an emergency physician and has worked as a health care administrator. 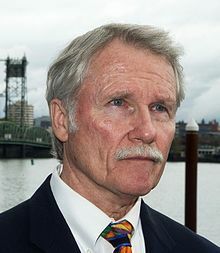 Born in Colfax, Washington, Kitzhaber graduated from Dartmouth College with a B.A. degree, earning his M.D. from Oregon Health & Science University. Kitzhaber began his career as an emergency physician before he was elected to the Oregon House of Representatives in 1978. He served one term in the Oregon House from 1979 to 1981 and was elected to the Oregon State Senate in 1980. He served three terms in the Oregon Senate from 1981 to 1993, and served as Oregon’s Senate President from 1985 to 1993. After his first tenure as governor, Kitzhaber became the director of the Center for Evidence Based Policy at the Oregon Health & Science University, served as the executive chair and president at both the Foundation for Medical Excellence and the Estes Park Institute, and founded the health care advocacy group the Archimedes Movement. In September 2009, Kitzhaber announced he would run for a third term as governor, defeating Oregon Secretary of State Bill Bradbury in the Democratic primary and former professional basketball player Chris Dudley with 49% of the vote in Oregon’s 2010 gubernatorial election. He was reelected to a historic fourth term in the 2014 gubernatorial election, defeating state representative Dennis Richardson. On February 13, 2015, facing a federal criminal investigation, Kitzhaber announced his intention to resign as governor effective February 18. Secretary of State Kate Brown succeeded him. In 2017, the federal government dropped its investigation against Kitzhaber without filing charges. The Oregon ethics commission found 10 instances when Kitzhaber used his political office for personal gain. He agreed to pay a settlement fine of $20,000. Kitzhaber was born on March 5, 1947, in Colfax, Washington, to Annabel Reed (née Wetzel) and Albert Raymond Kitzhaber. He graduated from South Eugene High School in 1965, Dartmouth College in 1969, and Oregon Health & Science University with a medical degree in 1973. Kitzhaber practiced medicine from 1973 to 1986 in Roseburg, Oregon, as an emergency physician. Kitzhaber began his political career in 1978 when he won election to the Oregon House of Representatives, where he served for one term. In 1980, he was elected to the Oregon State Senate, where he served three terms from 1981 to 1993 and was the president of the Senate from 1985 to 1993. As Oregon Senate President, he was the chief author of the state’s government-funded health care plan, the Oregon Health Plan. Republican anti-tax activist Bill Sizemore challenged Kitzhaber in 1998. Sizemore had founded Oregon Taxpayers United, a political action committee that lobbied against tax increases and promoted ballot measures limiting the use of union dues in political campaigns, in 1993. During the general election, The Oregonian newspaper reported Sizemore’s controversial business practices in his personal life, as well as in the operation of his political action committees and non-profit educational foundation. In the end, Sizemore provided only a token challenge and received 30% of the vote to Kitzhaber’s 64%. Kitzhaber developed policy initiatives related to natural resources during his two terms as governor, including The Oregon Plan for Salmon and Watersheds aimed at restoring dwindling runs of threatened salmon species to Oregon’s rivers and streams. The plan was a collaborative effort that encouraged federal, state and local government agencies to work with private landowners to restore watershed health and recover threatened salmon runs. Kitzhaber also took a high profile and controversial stand in favor of breaching several Northwest dams to help restore salmon populations. Managing growth, particularly in the Willamette Valley, was a priority of Kitzhaber and he was a staunch supporter of Oregon’s comprehensive land use system. He opposed attempts to weaken protection of farmland and enforcement of urban growth boundaries. Kitzhaber also created the Governor’s Growth Task Force and the Willamette Valley Livability Forum to help gather accurate information and outline integrated approaches for developing sustainable communities. His related Community Solutions program attempted to focus the efforts of numerous state agencies, other governments and interested groups in collaborative problem solving and coordination to manage various community development projects across Oregon. Under Oregon’s constitution, Kitzhaber could not seek a third consecutive term in 2002. In September 2009, Kitzhaber announced that he would run for a third term as governor, and in May 2010, won the Democratic primary, defeating Roger Obrist and the former Secretary of State of Oregon Bill Bradbury. In the general election, he ran against Republican Chris Dudley and several minor-party candidates, winning in an extremely close election. Their vote percentages were reported as 49.29% and 47.77%. Kitzhaber was sworn into his third term as Governor of Oregon on January 10, 2011, succeeding fellow Democrat Ted Kulongoski. On November 22, 2011, Kitzhaber announced that he might commute an upcoming death sentence scheduled to occur in the month ahead. Kitzhaber went on to announce that he would allow no death penalties to occur in Oregon while he is governor, calling the issuing of death sentences “compromised and inequitable”. The commuted inmate, Gary Haugen, made headlines when he refused to be pardoned, wanting to be executed. Senior Judge Timothy P. Alexander, assigned to Marion County Circuit Court, ruled that Haugen could reject the governor’s reprieve of his execution and move forward in his efforts to die by lethal injection. Kitzhaber appealed the decision to the Oregon Supreme Court, which decided in the governor’s favor on June 20, 2013. In 2012, Rolling Stone magazine named Kitzhaber one of “The Quiet Ones: 12 Leaders Who Get Things Done”, citing his decision to halt all executions in Oregon as “demonstrating just how effective government can be”. Kitzhaber presided over the failed launch of Cover Oregon, the state’s Affordable Care Act insurance exchange website. He was also disappointed in 2014 by the collapse of the Columbia River Crossing infrastructure megaproject, amid opposition from Republicans in Washington‘s state Senate and Clark County government. A more personal scandal struck the governor’s office late in 2014 when the Willamette Week exposed a previously unknown marriage between First Lady Cylvia Hayes and an Ethiopian immigrant in 1997. Hayes admitted to the union, which was dissolved in the early 2000s, and said it was an illegal green card marriage into which she entered for money during a difficult period in her life. Kitzhaber was reportedly unaware of the marriage until the Willamette Week’s investigation. Just days later, local news stations reported that Hayes was involved in another criminal scheme in 1997 involving a marijuana grow operation in Washington, to which Hayes also admitted. At the same time, Kitzhaber faced questions over Hayes’ consulting business and whether the first lady improperly used her position and relationship to the governor. Kitzhaber asked for an ethics review into Hayes’ business activities, which the state commission declined to look into. Kitzhaber publicly defended Hayes against criticism, saying the state executive branch followed protocol with regard to her consulting work and calling her past marriage a “personal issue”, although he admitted at a debate that he was “taken aback and hurt” to learn of it. Kitzhaber ran for reelection in 2014. While he consistently led opponent Dennis Richardson, a conservative Republican state representative from Central Point, in public polling and defeated him by a margin of 5.6 percent, his campaign faced controversy over the failure of Cover Oregon and the activities of Kitzhaber’s fiancée, Cylvia Hayes, with Richardson charging that the Governor and the First Lady were corrupt. Kitzhaber was sworn in for a historic fourth term as governor on January 12, 2015. At the start of his fourth term, he enjoyed the largest Democratic majorities in the Oregon Legislative Assembly he had seen in more than 12 years as governor. In his inaugural address, Kitzhaber indicated his fourth gubernatorial term would be the last one he would seek, saying it “will complete the arc of my political career”. He said he wanted to focus on socioeconomic inequality in Oregon during his last four years as governor of the state. Despite his efforts to pivot toward policy, Kitzhaber continued to grapple with controversies related to his fiancée and her work as a consultant and for the state. At a press conference on January 30, 2015, he said Hayes would play no further role in his administration, although he confirmed the couple still plans to marry. The Oregonian, which endorsed him in his 2010 and 2014 campaigns, went so far as to call on him to resign, although Kitzhaber said he would not consider doing so. Major Democratic officeholders in the state, including Treasurer Ted Wheeler, Senate President Peter Courtney, and House Speaker Tina Kotek, all issued statements on February 12 urging Kitzhaber to resign. Also on February 12, the Willamette Week reported that Kitzhaber’s executive assistant had tried to have thousands of the governor’s emails deleted the previous week. The next day, February 13, Kitzhaber announced his resignation (effective February 18, 2015) amid the scandal. 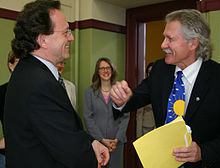 Dr. Kitzhaber (right) speaking with Dr. David Schleich at the National University of Natural Medicine promoting the Archimedes Movement, a health care reform movement. Kitzhaber serves as the director of the Center for Evidence Based Policy at Oregon Health & Science University in Portland, Oregon. He holds an endowed chair on health care policy at The Foundation for Medical Excellence, an educational foundation that produces continuing-education programs for physicians. Kitzhaber also serves as the president of the Estes Park Institute, a continuing-education organization for community health care leaders and hospital executives. On December 1, 2005, the Eugene Register-Guard reported that Kitzhaber was considering challenging incumbent governor Ted Kulongoski in the Democratic primary ahead of the 2006 gubernatorial election. One month later, Kitzhaber announced he would not do so. On January 13, 2006, Kitzhaber announced the Archimedes Movement, an organization seeking to maximize the health of the population by creating a sustainable system which uses the public resources spent on health care to ensure that everyone has access to a defined set of effective health services. The goal is to create a vision for a more equitable and sustainable system as well as the political tension necessary for its realization. A legislative proposal that took input from many Oregon residents was introduced in the 2007 Oregon legislative session. The Oregon Better Health Act failed to pass the 2007 Legislature after Kitzhaber was unable to overcome concerns raised by AARP about his inclusion of Medicare in his plan. Another health reform bill, a Senate proposal which was amended to include portions of the Archimedes Movement bill, passed instead. With the withdrawal of Tom Daschle‘s candidacy for United States Secretary of Health and Human Services, there was speculation Kitzhaber could be tapped for the position. However, Kitzhaber denied interest in the position and said that he was not being vetted. On February 7, 2014, Kitzhaber endorsed fellow Democrat Donald Berwick for Governor of Massachusetts. On May 2, 2016, Kitzhaber announced his endorsement for Vermont Senator Bernie Sanders in his 2016 race for the Democratic presidential nomination. Kitzhaber is of German descent. He married Rosemary Linehan in 1971; they divorced in 1974. He married Sharon LaCroix in 1995 and had one son, Logan, who was born in October 1997. The couple sought a divorce in 2003, soon after the end of his second term as governor. Kitzhaber lives with his fiancée Cylvia Hayes, founder of the environmental consulting firm 3EStrategies. In August 2014, the couple announced their engagement; no wedding date has been announced. During his political career, Kitzhaber became famous for wearing blue jeans during speaking engagements. When he wore jeans to his inauguration in 1995, he created a minor stir. During his 2010 campaign for a third term as governor, Kitzhaber frequently avoided the necktie as well, preferring a button-down shirt and suit jacket with no tie. Kitzhaber lives and works in Portland, and did not use the official gubernatorial residence of Mahonia Hall in Salem during his service as governor. ^ “Oregon Legislators and Staff Guide: State Government Legislators and Staff: 1981 Regular Session (61st): January 12-August 2”. Oregon Secretary of State. Retrieved February 13, 2015. ^ “Oregon results”. OregonLive.com. Retrieved January 15, 2015. ^ Nakamura, Beth. “Governor John Kitzhaber announces his resignation”. The Oregonian. Retrieved February 13, 2015. ^ Green, Aimee (June 17, 2017). “End of criminal investigation into Kitzhaber, Hayes comes as no surprise to experts”. The Oregonian. Retrieved 6 March 2018. ^ “Kitzhaber, John Albert, BA, MD – Brill Reference”. brillonline.com. ^ Lydgate, Chris. “In sickness and in health”. Willamette Week 25 Years retrospective. Archived from the original on December 7, 2008. ^ “Oregon Health Plan starts today”. Tri-City Herald. February 1, 1994. ^ Swisher, Larry (October 26, 1995). “Budget reform threatens Oregon Health Plan”. The Register-Guard. Retrieved December 28, 2009. ^ “Election history for Oregon” (PDF). Polidata – Demographic and Political Guides, Political Data Analysis. The Cook Political Report. 2010. Retrieved February 18, 2015. ^ “Governor Announces Comprehensive “Oregon Children’s Plan” – Effort Aims to Identify and Help At-Risk Youth from Birth”. State of Oregon Archives. January 13, 2003. Archived from the original on February 19, 2015. Retrieved February 18, 2015. ^ “Gov. John Kitzhaber stops executions in Oregon, calls system ‘compromised and inequitable‘“. The Oregonian. November 22, 2011. ^ “Governor John A. Kitzhaber”. ^ “Kitzhaber calls for breaching four dams”. The Oregonian. February 19, 2000. ^ “Oregon Governor John Kitzhaber’s letter to Congress on Elk Creek Dam (8/27/02)”. Archived from the original on April 6, 2012. Retrieved November 26, 2011. ^ “Governor John A. Kitzhaber’s Administration – Record Series Descriptions” (PDF). Oregon State Archives. State of Oregon. 2002. Retrieved February 18, 2015. ^ Mapes, Jeff (September 2, 2009). “Kitzhaber files committee to run for governor”. OregonLive.com. ^ “Oregon Democrat wins historic 3rd term as governor”. ^ “John Kitzhaber wins Oregon’s governor race”. The Oregonian. November 3, 2010. Retrieved November 4, 2010. ^ “Governor Results Map”. The New York Times. ^ Zheng, Yuxing (December 21, 2012). “Gov. John Kitzhaber files brief with Oregon Supreme Court over Gary Haugen death penalty reprieve”. Oregon Live. ^ Jung, Helen (June 20, 2013). “Oregon Supreme Court denies death row inmate Gary Haugen’s bid for execution”. Oregon Live. Retrieved February 14, 2015. ^ “The Quiet Ones: 12 Leaders Who Get Things Done”. Rolling Stone. 2012. ^ Robison, Peter (January 8, 2015). “How Local Politicians Scuttled a Crucial Federal Bridge Upgrade”. Businessweek. Retrieved January 15, 2015. ^ Manning, Jeff (March 7, 2014). “Columbia River Crossing: ODOT to pull plug, bridge project is dead”. The Oregonian. Retrieved January 15, 2015. ^ Jaquiss, Nigel (October 8, 2014). “Oregon First Lady Cylvia Hayes’ Undisclosed Third Marriage Was to 18-Year-Old Immigrant”. Willamette Week. Retrieved January 15, 2015. ^ “Broker: Hayes was leader in planned marijuana grow”. KGW. October 14, 2014. Archived from the original on January 16, 2015. Retrieved January 15, 2015. ^ Tilkin, Dan (October 13, 2014). “1997: Cylvia Hayes jointly bought property for pot grow”. KOIN 6 News. Archived from the original on January 16, 2015. Retrieved January 15, 2015. ^ “Oregon gov’s fiancée reportedly helped buy land to grow marijuana in 1997”. FOX News. October 14, 2014. Retrieved January 15, 2015. ^ Gunderson, Laura (November 7, 2014). “State ethics commission denies John Kitzhaber request to review Cylvia Hayes contracts, first lady role”. The Oregonian. Retrieved January 15, 2015. ^ Jaquiss, Nigel (October 10, 2014). “Gov. John Kitzhaber, Rep. Dennis Richardson Clash at City Club Debate”. Willamette Week. Retrieved January 15, 2015. ^ Roth, Sara (October 10, 2014). “Hayes admits to sham marriage, Kitzhaber defends fiancee”. KGW. Archived from the original on January 16, 2015. Retrieved January 15, 2015. ^ “Kitzhaber wins Oregon Governor, Richardson concedes”. KGW. November 5, 2014. Archived from the original on December 23, 2014. Retrieved January 15, 2015. ^ Wong, Peter (January 14, 2015). “Kitzhaber draws on history, inspiration for fourth inauguration speech”. Hillsboro Tribune. Retrieved January 15, 2015. ^ Staver, Anna (January 12, 2015). “Kitzhaber to be sworn in for historic fourth term”. Statesman Journal. Retrieved January 15, 2015. ^ Gunderson, Laura (January 12, 2015). “John Kitzhaber sworn in for final term, speaks of inequities among Oregonians”. The Oregonian. Retrieved January 15, 2015. ^ “John Kitzhaber: Cylvia Hayes won’t play political role in administration”. The Oregonian. January 30, 2015. Retrieved January 30, 2015. ^ “John Kitzhaber must resign: Editorial”. The Oregonian. February 4, 2015. Retrieved February 5, 2015. ^ “BREAKING: Top Oregon Democrats calling for Kitzhaber to resign”. KATU. February 12, 2015. Retrieved February 12, 2015. ^ Jaquiss, Nigel (February 12, 2015). “Gov. John Kitzhaber’s Office Sought To Destroy Thousands of His Emails”. Willamette Week. Retrieved February 12, 2015. ^ Nakamura, Beth (February 13, 2015). “Oregon Governor John Kitzhaber resigns amid criminal investigation, growing scandal”. The Oregonian. Portland, Oregon. Retrieved February 13, 2015. ^ Steves, David (December 1, 2005). “Walker puts decision on hold”. The Register-Guard. ^ “With Daschle Gone, Who Will Run Health and Human Services?”. WSJ. ^ Sam Stein, “Daschle Replacement Buzz: Bradley, Dean, Rendell, Sebelius,” Huffington Blog, February 3, 2009at huffingtonpost website. Retrieved February 5, 2009. ^ Colin Fogarty, “Kitzhaber Says He’s Not Interested In Cabinet Post,” February 5, 2009, at OPB News website. Retrieved February 5, 2009. ^ Robert Rizzuto (February 7, 2014). “Massachusetts gubernatorial hopeful Don Berwick lands endorsement from Oregon Gov. John Kitzhaber”. MassLive Politics. Retrieved August 13, 2014. ^ Gordon Friedman (2016-05-12). “Kitzhaber shares why he voted for Bernie Sanders”. Statesman Journal. ^ “Oregon Gov. John Kitzhaber shares his kuchen recipe from his great-grandmother”. Retrieved February 13, 2013. ^ Jaquiss, Nigel (June 30, 2014). “Rosemary Lee, Gov. John Kitzhaber’s First Wife, Dies”. Willamette Week. Retrieved February 13, 2015. ^ “Kitzhaber’s companion, Cylvia Hayes, takes on first lady duties under unusual spotlight”. The Oregonian. January 29, 2011. ^ “Oregon’s First Lady Weathers Criticism, Pushes Anti-Poverty Agenda”. NPR.org. June 18, 2012. ^ “Kroger’s Office Defends Prosecutor in Cylvia Hayes Probe”. Willamette Week. April 4, 2011. Archived from the original on October 26, 2014. Retrieved February 19, 2015. ^ Mapes, Jeff (August 4, 2014). “Oregon Gov. John Kitzhaber gets engaged to first lady Cylvia Hayes”. The Oregonian. Retrieved August 4, 2014. ^ “The Photo Vault: Kitzhaber’s blue-jeans shocker”. OregonLive.com. ^ “Who is Cylvia Hayes? Oregon’s first lady derailed by bad judgment, environmental zealotry, quest for validation”. The Oregonian. October 31, 2014. Retrieved January 15, 2015. ^ Esteve, Harry (December 3, 2010). “Gov.-elect John Kitzhaber plans to keep Portland home, use Salem mansion sparingly”. The Oregonian. Retrieved January 15, 2015. ^ Mapes, Jeff (August 4, 2014). “Oregon Gov. John Kitzhaber gets engaged to first lady Cylvia Hayes”. The Oregonian. Retrieved February 5, 2015. ^ “May 18, 2010, Primary Election Abstracts of Votes” (PDF). Oregon Secretary of State. Retrieved December 2, 2016. ^ “November 2, 2010, General Election Abstracts of Votes” (PDF). Oregon Secretary of State. Retrieved December 2, 2016. ^ “May 20, 2014, Primary Election Abstract of Votes” (PDF). Oregon Secretary of State. Retrieved December 2, 2016. ^ “November 4, 2014, General Election, Official Abstract of Votes: Governor” (PDF). Oregon Secretary of State. Retrieved December 6, 2014.